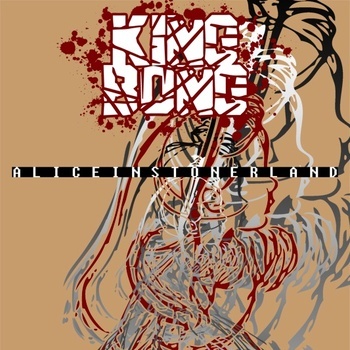 King Bong - "Alice in Stonerland"
The Italian stoners are back with another improvised jam. This is one long improvised jam that lasts about 35 mins. As it should, this long jam has many different parts and themes from 70’s rock style jamming, to slow doom rock, to just pure stoned rock riffs and spaced out stuff. It starts off with some nice melodic delay guitar as the bass and drums slowly crawl into the jam. The rest of this 1st of 5 parts is mostly just riffing as the drums get more intense. The 2nd part the track gets pretty doomy and then Andrea kicks in with some intense guitar soloing, while Alberto (bass) and Ted (drums), keep the jam moving forward. Alberto switches out of solo to intense wah pedal action as Alberto plays some cool bass lines and the drums really notch it up as well. The drums get a bit of a distorted sound as the band blasts out of this last section and into part 3, where the more doomy guitar returns and now Ted starts making some funny stuff with the drum pad as Alberto is making some freaked out sounds with his bass pedals and then Andrea joins in as it gets very spaced out. The band then kicks into a very cool wah guitar section now. Now there is a very cool section where they are doing this stop, start with the drums, bass and guitar and they have sampled all these different animal sounds. That is pretty cool. The last section goes back to a more melodic section like the track started. This part is perhaps the weakest and only part I did not like that much but there is some nice wah guitar at the end. Pretty cool stuff.